“Our wedding was an amazing day. Julie managed to turn my dreams into reality and made it a day to remember.” Sivan and Gese approached Julbilation two months before Gese was to be deployed to Afghanistan needing their entire wedding planned. We sat down together to set a budget and to find out what the most important to Gese and Sivan, they wanted to have a large venue for all their guests and a way for their children to be part of the ceremony. As the weeks went by Julbilation helped Sivan and Gese choose their wedding attire, their ceremony and reception location, menu, scheduled a photographer and DJ, designed décor of reception including floral center pieces and linens, and designed invitations and tracked RSVPs. Bobby and I planned an amazing wedding. Julie and Molly executed it AMAZINGLY! Thank you for making our wedding so speical and one we will always remember. They wrangeld family pictures, created an amazing ceremony, and most of all allowed us to enjoy our wedding! Thank you so much for everything you did to make our day run smoothly and effortlessly. It was amazing! You took my vision and planning and created something more wonderful then I had imagined. Last minute weather changes and a sick bride could not stop you. You supported me and guided me through of the day, reminding me to breathe and rest! My mother always said you were her wedding present to herself. I am so thankful that she was able to relax and enjoy the day. You truly were the best wedding present we got! Julie pays very close attention to every last detail. The things you forget, Julie will remember. She will stay on you to complete your tasks, or she will do them for you. She eliminated the stress of planning my daughter's Bat Mitzvah. I got to sit back and enjoy myself, visiting with friends and family who traveled a long way to share our joy. From the invitations to the photographer to the caterer to the decorations to the myriad details on the day of the event, Julie and her team handled it all with cool control. Thank you, Julie! Thank you, thank you, thank you for making Sarah’s Bat Mitzvah an amazing event. We heard many, many compliments from our guests and relatives about the décor and design and all the Broadway details. We know how much work went into making Sarah’s Broadway Mitzvah a fabulous party and we appreciate all your efforts and special attention. 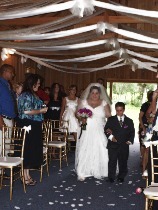 You and your team carried out our vision for Sarah’s big day in ways that went well beyond our expectations. It was absolutely fantastic – definitely one of the best days of our lives. Thank you for doing a great job this weekend. I received a lot of compliments about how smoothly the event was Saturday night, so I thought I would pass that on. Thanks for keeping a close eye on the doorways too. The kid crowd seemed very much under control. Julie from Jubilation was so amazing knowing just when to step in and help me, when and where I needed it, for my son Spencer’s Bar Mitzvah. I wanted to do some of the party planning myself and Julie knew just when take over and let me enjoy the party. Thanks it was the best party ever!! 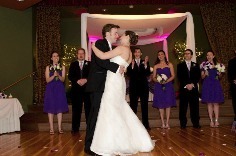 I tell everyone that hiring Julie was the best decision we made during the process of wedding planning. From the first meeting we had, she seemed to have an intuitive sense of what we wanted with everything from the feel of the event to the color scheme. She was incredibly knowledgeable and guided us on whatever we needed from helping pick out tuxes to organizing the processional. She provided us with options for vendors that were available for our date and reputable, which made what could have been an incredibly overwhelming endeavor virtually seamless and stress-free. On the day, she ran a tight ship, making sure every detail was orchestrated to a tee. She was even right there for me after I ripped my dress during pictures with a sewing kit! She had great ideas for welcome bags for all our out-of-town guests and added great touches that we could tell came from developing great relationships with local Orlando businesses, as well as just being a savvy and experienced event planner. I have nothing but positive things to say about Julie. She went above and beyond the call and I would absolutely recommend her to anyone! Julie and Julbilation were essential pieces of a wonderful celebration during Zachary’s Bar Mitzvah weekend. From the beginning, Julie had creative ideas to incorporate Zach’s golf theme into the reception. She coordinated photographers, caterers and DJ’s in a seamless flow. Little details at the temple and our reception site were taken care of before they existed! Once I handed over my “binder” to Julie I completely enjoyed myself and my guests during a fabulous weekend. We could not have such a fantastic weekend without Julbilation!! 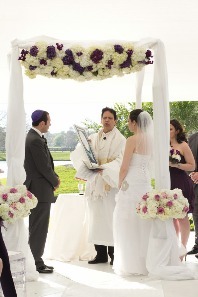 Julbilation is already booked for our next family simcha! I cannot put into words how amazing it was to work with both you for Ellie’s Bat Mitzvah! Thank you for all of the hard work, amazing communication and behind the scenes attention you put into making the whole weekend fun and effortless. Thank you from the bottom of my heart. Thank you for all of your help last night. Sheila was absolutely correct when she stated what a calming force you were in a party setting. It was a pleasure working with you and so appreciated. I will provide your information to anyone looking for assistance with any type of event and I'm certain you will be hearing from us in the fall.